Gov. Mike Dunleavy announced changes to the board of the state gas line agency on Monday, the same day officials confirmed the head of the agency was awarded $296,000 in bonuses in late December. The performance-based bonuses for Keith Meyer, president of the Alaska Gasline Development Corp., come atop his $550,000 annual salary, the highest at the state. A three-member executive committee for the agency approved the annual bonuses for Meyer for work done the last two years, said Tim Fitzpatrick, a spokesman with the agency. The awards were based on Meyer’s performance that includes progress on the $43 billion Alaska LNG project, following an evaluation by the full board in November, Fitzpatrick said. “All seven AGDC board members participated in the performance evaluation that was used to determine Keith’s performance bonus and based on this input, the executive committee determined the final performance bonus amount for each year,” he said. The Alaska LNG project involves building an 800-mile pipeline that would be used to ship North Slope gas to Nikiski, where a plant would liquefy it for shipment to Asian buyers. Meyer was hired in June 2016. He was awarded a $139,000 bonus for his first year of work, and $157,000 for his second year. Under Meyer’s helm, the agency has signed numerous preliminary agreements to advance the project, including with multiple gas buyers in Asia and three major Chinese-owned entities that might take a major stake in the project, including oil and gas giant Sinopec and Bank of China. Recently, the agency missed its goal of completing a final deal with the three Chinese companies by Dec. 31. It has instead sought six more months. Gov. Mike Dunleavy, elected in November, is weighing changes to the structure of the Alaska LNG project. He has said he favors a project run by the private sector, a departure from the current project run by the state. Dunleavy’s office on Monday announced new appointments for the board’s two seats held by state department heads. Commissioners Jason Brune, overseeing the Department of Environmental Conservation, and Tamika Ledbetter, overseeing the Department of Labor, replace former labor commissioner Heidi Drygas and former transportation commissioner Marc Luiken. Dunleavy also replaced two of the board’s public members, appointing Doug Smith, former president of ASRC Energy Service, and Dan Coffey, former Anchorage Assembly chair. They replace board members Hugh Short and Joey Merrick. Short and Merrick were two of the three members of the executive committee who approved the bonus for Meyer. AGDC chair Dave Cruz, also part of the executive committee, remains on the board. Cruz said Meyer earned his bonus. In addition to a performance review, the board took into account comparable pay for an executive, like Meyer, with nearly 40 years of experience in the gas industry. “He has a guideline of deliverables to qualify for that bonus he had to fulfill,” Cruz said. 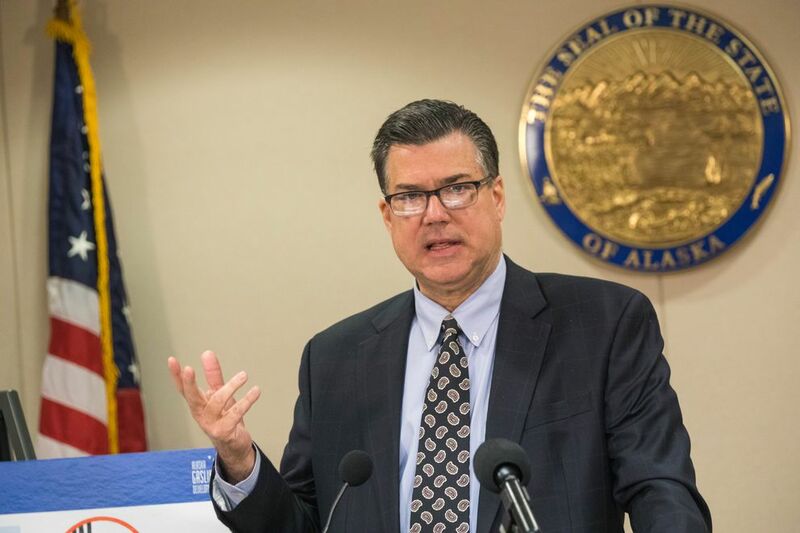 Fitzpatrick said Meyer had proposed taking his bonuses as stock in a subsidiary of Alaska LNG, when that subsidiary issued stock in the future. But that option was rejected. “He offered that out of the belief there should be alignment between executives and shareholders, and in the belief there’s a great potential growth opportunity here. But the board opted to not take that option,” Fitzpatrick said. Meyer’s $550,000 annual base salary is the highest among all state employees, according to data provided by Laura Cramer, deputy directer of the Office of Management and Budget. With benefits, not including the bonus, Meyer makes $755,000, she said.